State President Nguyen Minh Triet and his entourage attended a ground-breaking ceremony of the Hanoi-Moscow Culture and Trade Centre in Moscow on May 10. State President Nguyen Minh Triet ( R ) attends a ceremony of the Hanoi-Moscow Culture and Trade Centre in Moscow. Addressing the ceremony, President Triet emphasised that construction of Vietnam and Russia culture and trade centres in Moscow and Hanoi, respectively, is a vivid manifestation of the development of traditional friendship and strategic partnership between the two countries as well as the two capital cities. He thanked the Moscow authorities for creating favourable conditions for the construction of the centre in the political, economic and cultural hub of Russia. 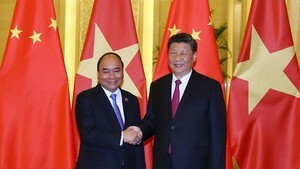 The President called for Russian businesses to increase investment in Vietnam, firstly in Hanoi and Ho Chi Minh City . 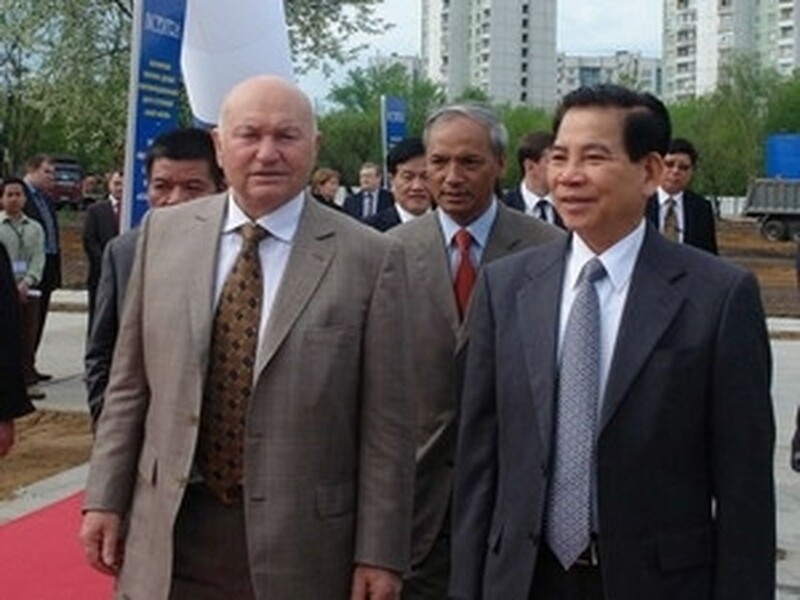 He expressed his hope to welcome Moscow Mayor Yuri Luzhkov in Hanoi on the occasion of the city’s 1,000th anniversary. Mayor Luzhkov and Chairman of the Hanoi People’s Committee Nguyen The Thao both pledged to strengthen and expand cooperation between the two capitals, contributing to promoting the two countries’ cooperation in all aspects, particularly economy-trade, culture, sports and tourism. During the ceremony, a credit and financial service contract for the project was signed between the Bank for Investment and Development of Vietnam (BIDV), the Vietnam-Russia Joint Venture Bank (VRB) and the Hanoi-Moscow Trade Centre Investment Joint Stock Company (INCENTRA), the main investor of the project. The 190 million USD culture-trade centre is being built in Moscow's north-east district on an area of 4.9 hectares. The centre is to encompass a 22 storey apartment and hotel block and a seven-storey building, which includes a trade and exhibition complex, sport-entertainment area and a multi-function hall. It is expected to be complete on May 10, 2013. The same day, President Triet and his entourage left Moscow for the Republic of Kalmykia.